Following the posting on the Central Bureau's Transient Object Confirmation Page about a possible Supernova in M99 spiral galaxy (TOCP Designation: PSN J12184868+1424435) we performed some follow-up of this object through a 0.50-m f/6.8 astrograph + CCD + f/4.5 focal reducer from MPC Code H06 (iTelescope, New Mexico). (equinox 2000.0; UCAC-3 catalogue reference stars). Before the discovery of this transient, three supernovae were observed in M99: 1967H (type II), 1972Q (type IIP)and 1986I (type IIP). According to Cbet 3795 issued on January 30, PSN J12184868+1424435 is a type-Ic supernova with official designation 2014L. 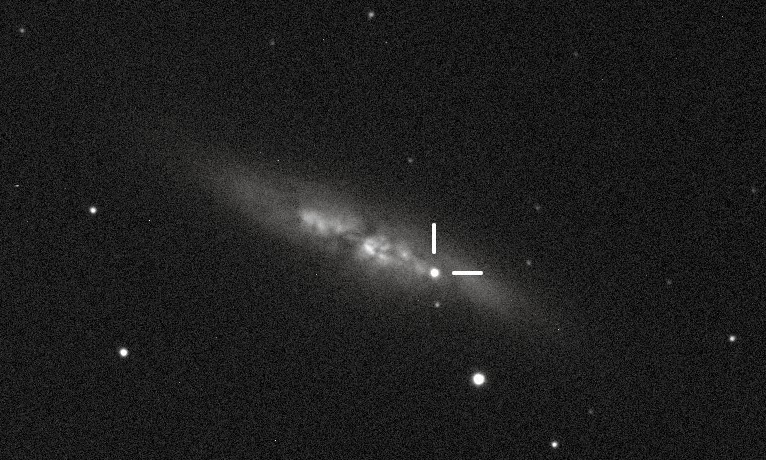 The supernova has been discovered on unfiltered CCD images taken on Jan. 26.83 UT using the 0.6-m NAOC Schmidt telescope in the course of the THU-NAOC Transient Survey (TNTS). Following the posting on the Central Bureau's Transient Object Confirmation Page about a possible Supernova in M82 (TOCP Designation: PSN J09554214+6940260) we performed some follow-up of this object through a 0.50-m f/6.8 astrograph + CCD + f/4.5 focal reducer from MPC Code H06 (iTelescope, New Mexico). According to the ATel #5786 this is a Type Ia supernova with a Si II velocity of 20000 km/s (spectrum of this transient has been obtained with the Dual Imaging Spectrograph on the ARC 3.5m telescope). We have received an e-mail from the UCL (University College London) media office reporting that students and staff at UCL's teaching observatory, the University of London Observatory, have spotted this supernova in M82 on the night of January 21. According to UCL website: "At 19:20 last night (21 January), a team of students assisted by Dr Steve Fossey spotted the exploding star in nearby galaxy Messier 82 (the Cigar Galaxy). The observations have been submitted to the International Astronomical Union's Central Bureau for Astronomical Telegrams, which is the official arbiter of supernova discoveries. Their official report has not yet been issued, and the supernova is therefore still nameless, but UCL appears to have been among the first, if not the first, to spot the event." While we wait the release of the official CBET by Central Bureau for Astronomical Telegrams (CBAT) with the discovery credit, congrats to Dr Steve Fossey and his students for this discovery. While this is not the nearest supernova to Earth since the Supernova 1987A (the Type II SN 1993J in M81 was at essentially the same distance within the uncertainties as this new one in M82 and SN 2004am and SN 2008iz -detected only at radio wavelengths- occurred within M82 itself), this is the closest supernova Type Ia to Earth since SN 1972E. Below you can see the discovery image (click on it for a bigger version). According to CBET 3792 issued on January 23, Stephen J. Fossey, University of London Observatory (ULO), University College, London, reported the discovery of an apparent supernova (magnitude R = 10.5) in the galaxy NGC 3034 = M82 on CCD images obtained by himself (and assisted by students B. Cooke, G. Pollack, M. Wilde, and T. Wright) in poor sky conditions with a ULO 35-cm Schmidt-Cassegrain telescope (+ SBIG STL-6303E camera) at Mill Hill, London, on Jan. 21.805 UT. 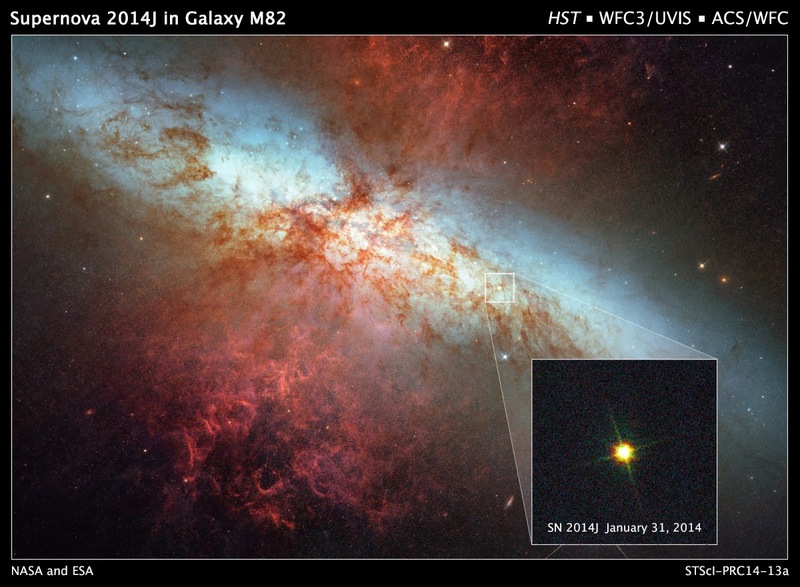 The supernova has been designated SN 2014J. New animation showing a comparison between an image taken on January 23, 2014 and an archive image (dated back to 2013-11-22) both by 2-meter Faulkes Telescope North (operated by LCOGT). Animation by E. Guido, N. Howes & M. Nicolini. Click on the thumbnail below for a bigger version. On January 31, the Hubble Space Telescope imaged SN 2014J as it approached its peak brightness. The image, shown here as an inset, was taken in visible light with Hubble's Wide Field Camera 3. This image was superimposed into a photo mosaic of the entire galaxy taken in 2006 with Hubble's Advanced Camera for Surveys. Click on the image below for a bigger version. Cbet nr. 3783, issued on 2014, January 16, announces the discovery of an apparently asteroidal object (discovery magnitude ~18.1) by Cristovao Jacques, Eduardo Pimentel, and Joao Ribeiro de Barros on CCD images obtained on Jan. 12.0 UT with a 0.45-m f/2.9 reflector of the Southern Observatory for Near Earth Research (SONEAR) at Oliveira, Brazil. 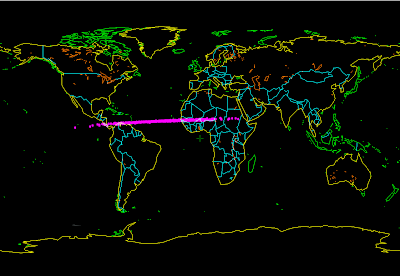 The object has been found to show cometary appearance by CCD astrometrists elsewhere and then also by Jacques et al. The new comet has been designated C/2014 A4 (SONEAR). We performed follow-up measurements of this object, while it was still on the neocp. Stacking of 19 unfiltered exposures, 90-sec each, obtained remotely from MPC code Q62 (iTelescope, Siding Spring) on 2014, January 13.4 through a 0.50-m f/6.8 astrograph + CCD, shows that this object is a comet: small coma nearly 5 arcsec in diameter with a hint of elongation toward North-East. Below our confirmation image obtained with Faulkes South. Click on it for a bigger version. Big congratulations to our friends Cristovao, Eduardo & Joao Ribeiro for this discovery!! The discoverers dedicated this new comet to two great comet observers that are not among us anymore: Vicente Ferreira de Assis Neto & Giovanni Sostero. You can read here the discovery story written by Cristovao Jacques. M.P.E.C. 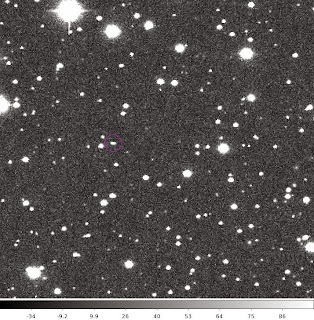 2014-A02 issued on 2014 Jan. 2 at 13:08 UT reports the discovery of the asteroid 2014 AA (discovery magnitude 19.1) by Mt. Lemmon Survey (MPC code G96 - Observer R. A. Kowalski) on images taken on January 1.2 with a 1.5-m reflector + CCD. 2014 AA (that is the very first asteroid discovered in 2014) had an estimated size of 1.7 m - 3.8 m (based on the object's absolute magnitude H=30.9). It is virtually certain that 2014 AA hit the Earth's atmosphere on 2014 Jan. 2.2 +/- 0.4, as demonstrated by independent calculations by Bill Gray, the MPC and Steve Chesley (JPL). 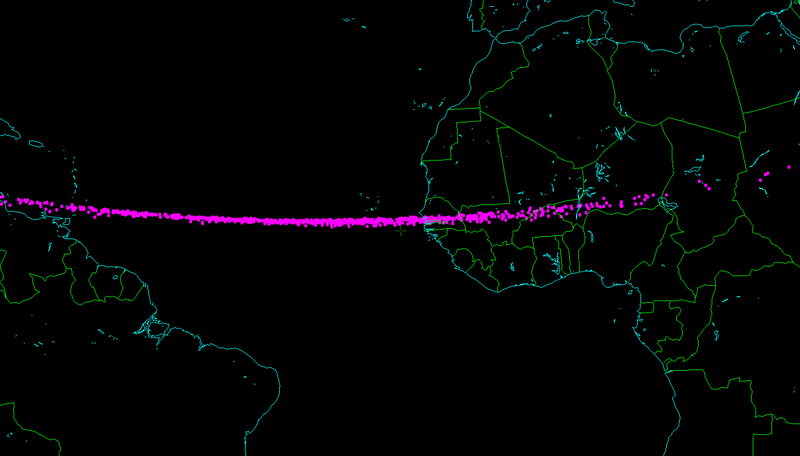 According to Chesley, the impact locations are widely distributed, most likely falling on an arc extending from Central America to East Africa, with a best-fit location just off the coast of West Africa on Jan. 2.10. 2014 AA was unlikely to have survived atmospheric entry intact, as it was comparable in size to 2008 TC3, the only other example of an impacting object observed prior to atmospheric entry. Below you can see one of the discovery images of 2014 AA. 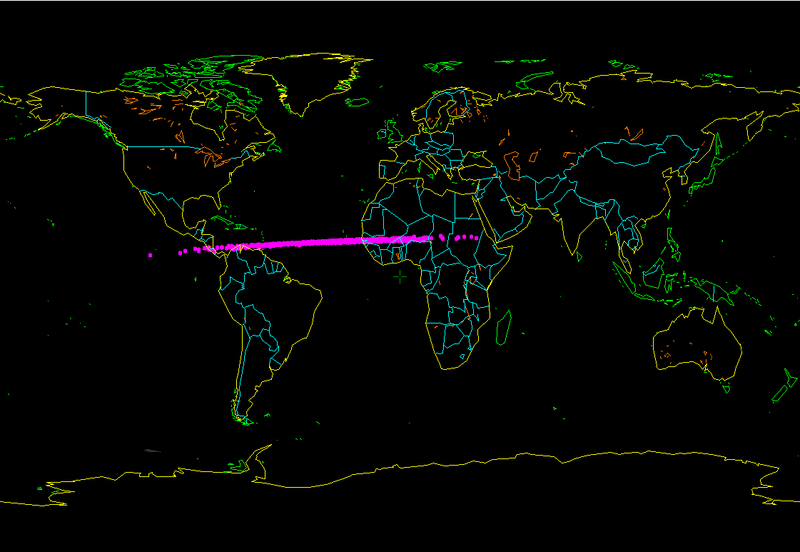 The asteroid is the streak just left of center, surrounded by the purple circle. These maps are based on half-arcsecond Monte Carlo noise. The corresponding impact times and locations are listed here. The animation below made by Pasquale Tricarico shows the Earth as observed from the asteroid 2014 AA, using the nominal orbit solution. In the background are visible the Sun and the Moon. 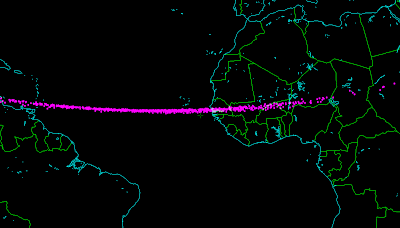 The asteroid approaches the Earth from the night side, and enters Earth's shadow cone at approximately 01:45 UT of January 2, approximately 40 minutes before entering the Earth's atmosphere. (click on it for a bigger version). According to NASA/JPL "so far, there have been a few weak signals collected from infrasound stations in that region of the world that are being analyzed to see if they could be correlated to the atmospheric entry of 2014 AA." Below an animation made out of the discovery images of asteroid 2014 AA. It was taken between 0618 and 0646 UT of January 1, 2014. The slight "streaking" of the asteroid in the image is due to its rapid motion across the background of stars as it approached the Earth. The brightness of the asteroid was around magnitude 19 at the moment of its discovery. Infrasound records analyzed by Peter Brown of the University of Western Ontario suggest an impact energy between 500 and 1,000 tons of TNT. Three infrasound stations detected very weak signals that were used to pinpoint the location of the energetic explosion. 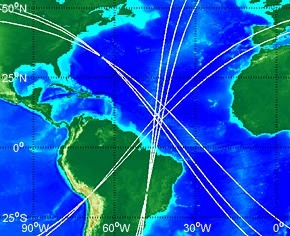 Triangulation by Brown using those records, shown in the graphic below, indicates that 2014 AA finished its race into the atmosphere likely near 40° west, 12° north (about 3,000 km east of Caracas, Venezuela, over the Atlantic). Read more about this here on S&T.